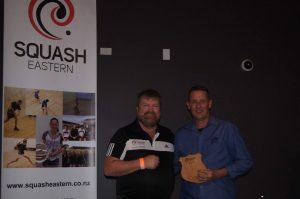 SQUASH EASTERN AWARDS was held Saturday 10th November at The Taradale Club. The following are the awards presented on the night. • Kent started the year as an E2, spent a couple of weeks in C Grade and is now only 20 points off moving back to C2. • Wayne has always been one of the first to volunteer for working bees, turns up to support his club at challenge events. Squash is his passion and he has often been known to get back home after a night shift to put together a draw – much to Karen’s disgruntlement!!! 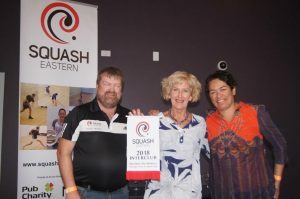 • Gisborne is an integral part of the Squash Eastern family and 3 out of the 5 members of the 2018 Eastern Junior Boys team were from Gisborne. Willz was a part of that team and the fact that Kahn Grayson and Quade Hyde also made the team was due, in a very large part, to the coaching and mentoring from Willz Donnelly. • Kahn was the District’s most improved boy by some margin, moving from C2 in October 2017 to B1 today. Quade Hyde spent 2017 on the sidelines having had a back operation but with the guidance and coaching of Willz has moved from C1 in April to B2 today. 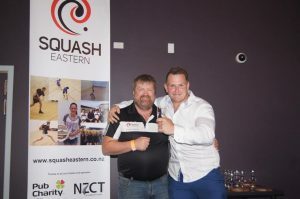 • Willz has recently come on board as coach in the Squash Eastern Junior Academy, so will continue to work with both Quade and Kahn over the next year. 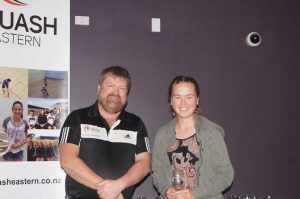 • set up a relationship with Matawai School; he spent a couple of days there this year, with Winona-Jo Joyce, to give the parents some coaching tips and run a coaching clinic for the kids. This is supported by Eastern and another trip is being organized, with the plan for 3 more next year. 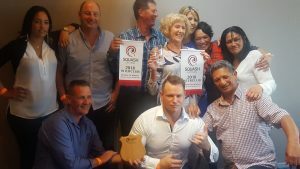 • The hours of commitment Murray puts into his coaching has had a positive impact on membership and participation and he is a key part and invaluable asset to Havelock North Squash Club. The outstanding performances and support from both player and coach are a testament to him and his club. • Rick is always around when there is a party to be had. He especially loves all teams’ events, getting behind the Club’s and Eastern’s teams with full gusto. • Karaoke, and Rick is there – singing off with the likes of Willie Donnelly. Coincidentally, tonight is the Taradale Club’s Karaoke night, so once this ceremony is finished we suggest you hop along to the next room and give your voices a work out!!! • The team consisting of Jess Dean, Ally Harding, Sam Harding, Sara Dooney & Libby Dean won the National Secondary Schools title in August, the first time a school from Eastern – either Boys or Girls – has achieved this. • 4 of the 5 girls are members of HBLT&SC and Sara Dooney is a member of HBSRC. • A new Executive committee come on board in November 2017 with a Squash committee of 12 people many of whom were new members to the club and to a committee. 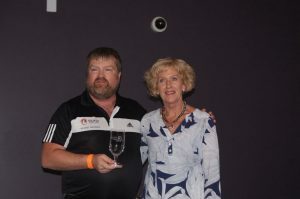 • The club ran 5 Squash Tournaments, Hastings Doubles, Hastings Open, Hastings D Grade & Below, Hastings Masters and the Superchamps Eliminations, although the D Grade and below was cancelled due to lack of entries. In lieu of this they ran a one-day tournament, which possibly brought in more numbers than the tournament would have. • The club received a number of positive comments about the comfort and appearance of the club from a number of out-of-towners. • The Club won G&H with a number of new players playing this event for the first time. • Along with the calendarized tournaments, the club ran a Business House League throughout the year, comprising of eight teams every Thursday. This is a very popular event is very popular bringing in new people to the club. • They also ran the “not so PC” event, Honki/Hori again again this year. 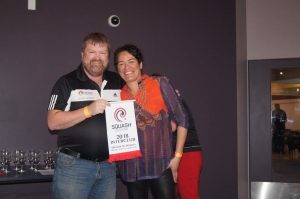 A great social squash event bringing together Pakeha and Maori challenging each other on the court. This year saw the Hori’s take out the challenge. • The Club also hosted a number of other groups and events. Quiz Night for Ladies Hockey Team; Tennis Eastern meetings; and number of other fundraising events. • Schools – this year saw St John’s College booked all courts for 14 weeks, Lindisfarne College booked 3 courts for 11 weeks and also the Secondary school competition of 4 courts for 9 weeks on a Monday. • The club continues to work on upgrading its systems and appearance. This year has seen the upgrade of the booking system from Sports Manager II to Pay2Play. Along with the booking system the club also put in the Pay2Play lighting controllers. The upgrade to Pay2Play was seen as a very positive move. It reduced the administration tasks of our volunteers in the club office and also brought in some additional income from casual bookings. • The Bistro has been running throughout the year with a dedicated bistro lady. This has been fantastic for the club and is now seeing friends and families come up for a meal as well. • Obviously, no club can survive and run smoothly without the continued commitment from volunteers. The committee this year (and previously) have been committed to the cause and always put in 110% effort, with monthly executive meetings held to stay on top of the club needs. • In summary, the club continues to move forward in membership and in appearance. It is a warm and welcoming club along with welcoming members. In addition, with the committed committees will continue to grow in membership and strength. It is the committees and most importantly, the members that make this club what it is!